Epact: Ring Dial unsigned, circa 1480 ? 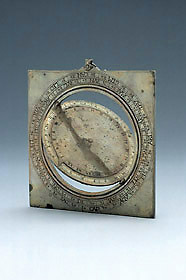 This rare type of dial is the forerunner of the equinoctial ring dial, and is in fact a form of astronomical ring dial without an equatorial ring. To use the dial, the sliding ring is set to the latitude and the alidade is set to the declination. The instrument is then suspended and the disc is turned until the sights are directed towards the sun. The distance between the notch on the sliding ring and the notch in the centre of the zodiac scale is measured by a small ruler, where the time may be read directly.